The PLN foundation organized an outstanding PLN-patient information day at the AMC on Saturday the 4th of November. 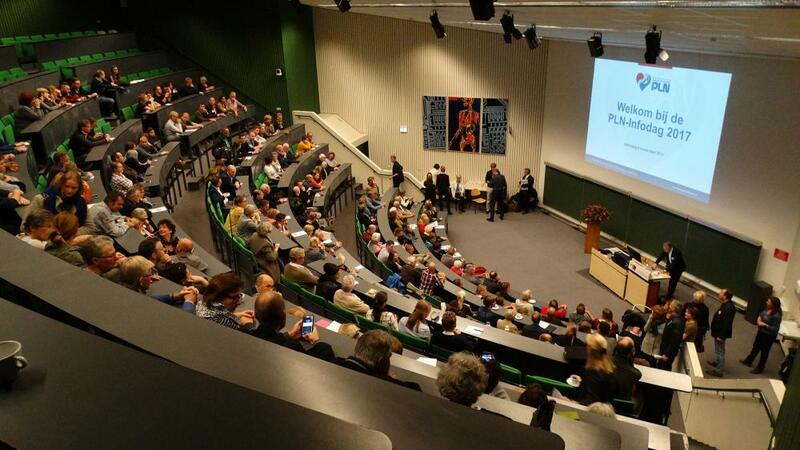 More than 250 people participated in an extensive and versatile program, including talks from scientific experts as well as elaborate public discussions between patients, doctors and scientists. People carrying a mutation in the phospholamban (PLN) gene are at high risk to develop heart failure and arrhythmias. A Dutch ancestor carrying the first PLN mutation most likely lived in the North of the Netherlands, between 575 and 825 years ago. After the discovery of the PLN mutation in 2012, over 1000 carriers have been identified. A mutation in the PLN gene is estimated to be responsible for 10% of hereditary heart failure cases in the Netherlands. Both national and international research is ongoing to find novel mechanistic insights and new treatment options for PLN patients. During the PLN-information day, the Durrer Center for Cardiovascular Research, together with scientists from the AMC and UMCU organized a ‘prikpost’, where over 80 PLN-carriers donated blood for scientific research. The samples are stored in the biobank of the Durrer Center and will be studied in different academic centers. Also see the report in Dutch on the site of the patient organisation Stichting Hartspierziekte PLN.